A long-awaited summer has come. 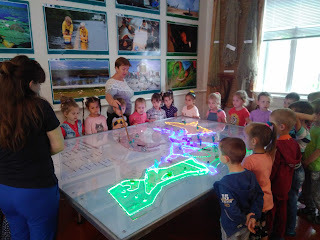 Information and touristic centre of the reserve is happy to receive its little visitors: pupils of kindergarten “Rodnichok” of Vilkovo, students of schools of Kiliyskiy and Tatarbunarskiy districts. The young guests have a virtual tour to Danube delta to find out about its inhabitants and implement their artistic talents by painting the animals of the Danube biosphere reserve with coloured chalks on the ground.